Imagine a pristine English garden party, all chinos, boating jackets, Pimms, and a nice singalong. It's almost political. A bit Brexit, as the phrase goes. And it's also the framework for the new Fat White Family video..
Because, y'see, 'Tastes Good With The Money' is a squelching, honking, splattering, surrealistic vision of the decaying remnants of the British upper classes. I’ve been making it known for years how much I wanted to make a video for this band. I’m a massive fan of FWF and I’ve been chasing this opportunity for a long time. I used every possible connection I had, I have asked people to ask people, I’ve contacted the band on social media, I really set my heart on this. For me there’s such a charm about them and an authenticity that’s actually incredibly rare. I knew I could not possibly work with a more magnetic bunch of performers. The idea of referencing Monty Python partly came out of the somewhat absurd and confusing political landscape that we are now living in Britain, Python seems prescient. The British laughing at themselves, a certain kind glee even in the loss of empire, singing as the ship goes down, well it just seems so... of the moment. There is this deep ambivalence to the establishment that resonates with the Fat Whites own irreverent world view. Most of all I wanted an idea that would give them the confidence and the space to really let go and just perform, too allow them to be raw in what is essentially an unnatural situation for a bunch of ne’er do well musicians. 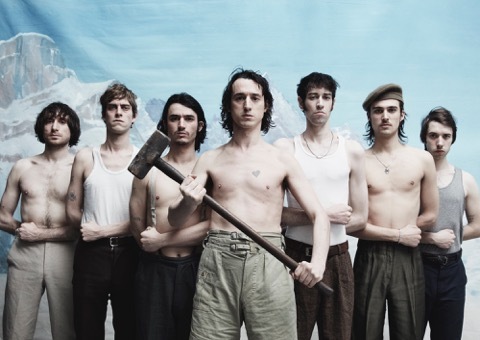 Fat White Family will release new album 'Serf's Up!' on April 19th.